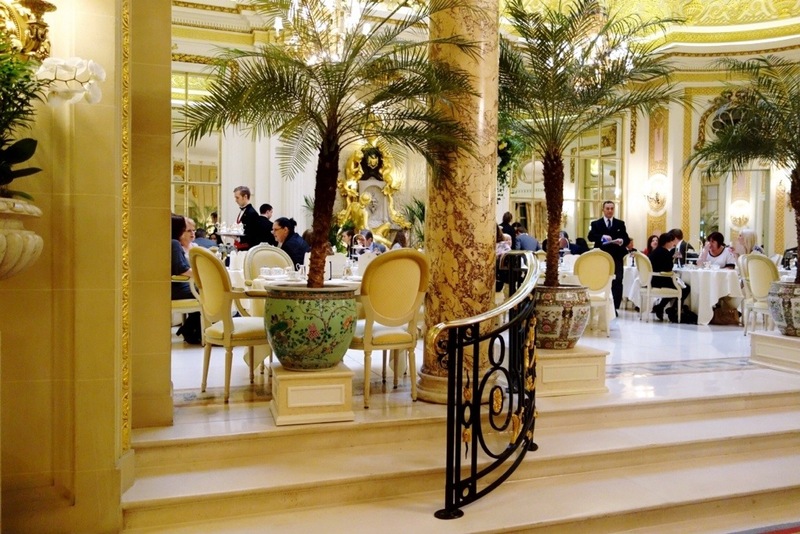 Afternoon Tea at the Ritz – Where Did Mary Go? Can you recall the fanciest moments of your life? My fanciest moment to date only just happened. And it obviously involved food. But it is an experience I will remember for a long time to come. 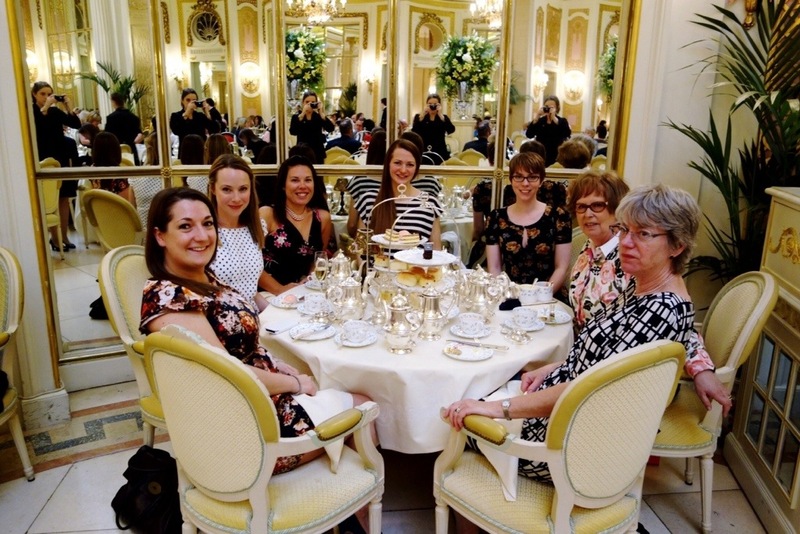 To celebrate her impending nuptials, my new sister-in-law Rosie invited a small group of ladies to join her for afternoon tea at The Ritz in London. 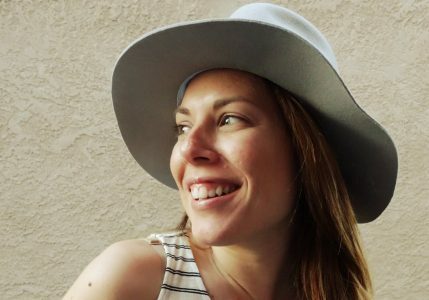 I was lucky enough to be one of the selected few, and I replied with an immediate “YES!” What could be better than the ultimate posh British experience as a lady in London?! 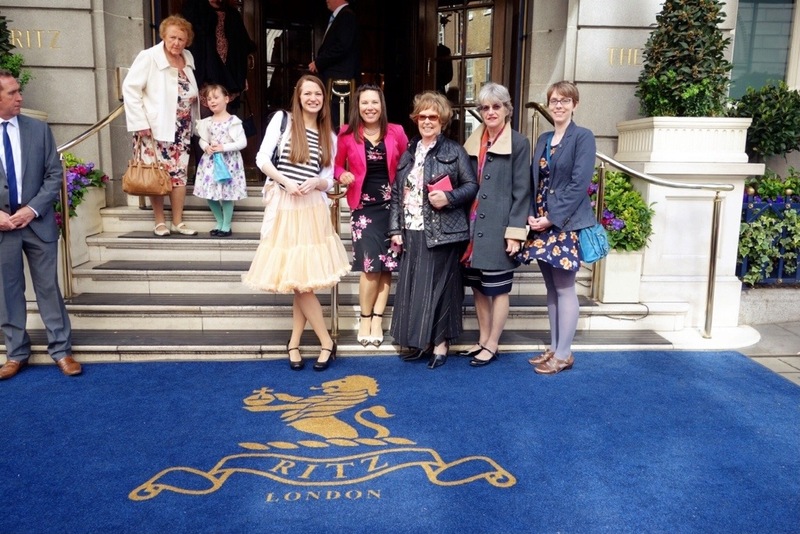 I put on my borrowed pearls, dress and heels, and hopped the tube to Green Park station along with Rosie and my mother-in-law Sue, which deposited us just around the corner from the main entrance to the Ritz. The rest of the party would meet us there – Rosie’s mum Jenny, Rosie’s sister-in-law Hannah, and the two bridesmaids Lucy and Sarah. As soon as we entered the revolving door, it felt like I was in a dream. Apart from The Plaza in NYC, I don’t think I’ve ever been in a fancier hotel. 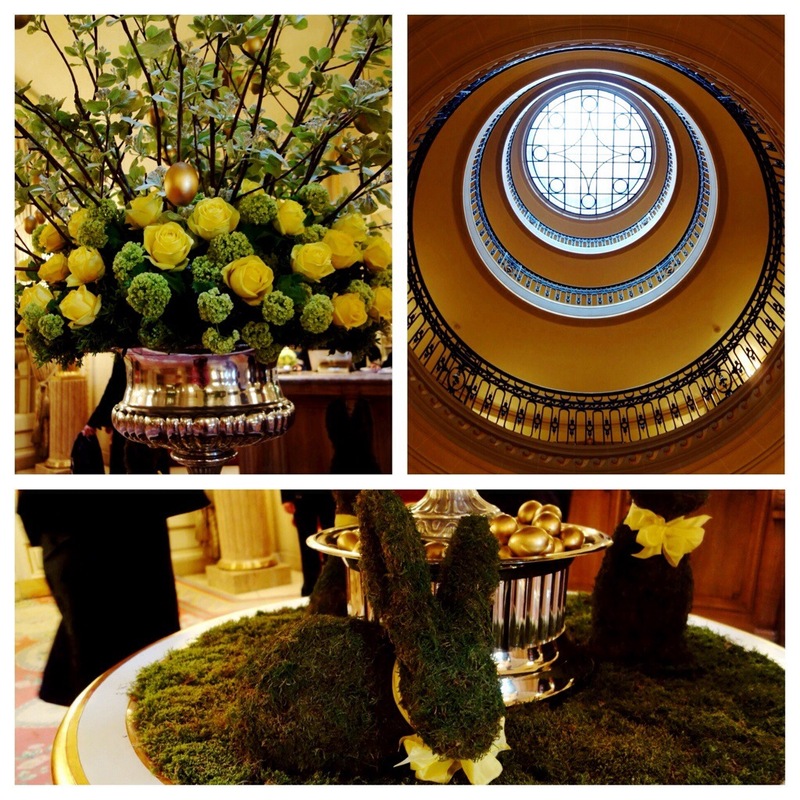 From the massive floral centerpiece at the table near the registration desk, complete with Easter bunnies and golden Easter eggs, to the marble columns that welcome you to The Palm Court and golden accents in abundance, you cannot help but gasp at the sheer opulence of the iconic establishment. 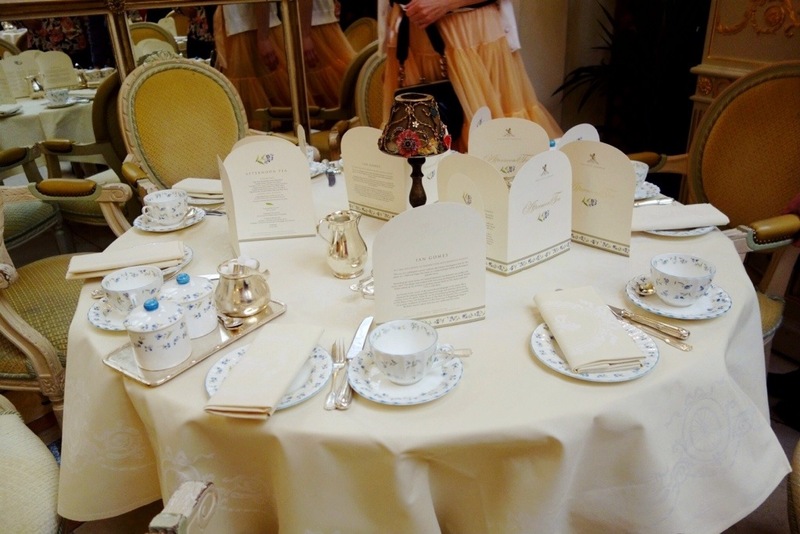 After retiring jackets to the cloakroom, our party was ushered to our table, which was already filled with forget-me-not flower covered China, polished silver flatware, and afternoon tea menus. Each of us took our seats, and began deciding which tea we would select from the more than dozen options. I wasn’t sure if we would have a few pots to share, and if we would get to try a few different teas throughout our two-hour allotment. Turns out you each choose a tea flavor that becomes yours for the duration. Fruity herbal teas are my favorite, so I went with Lemon Verbena. 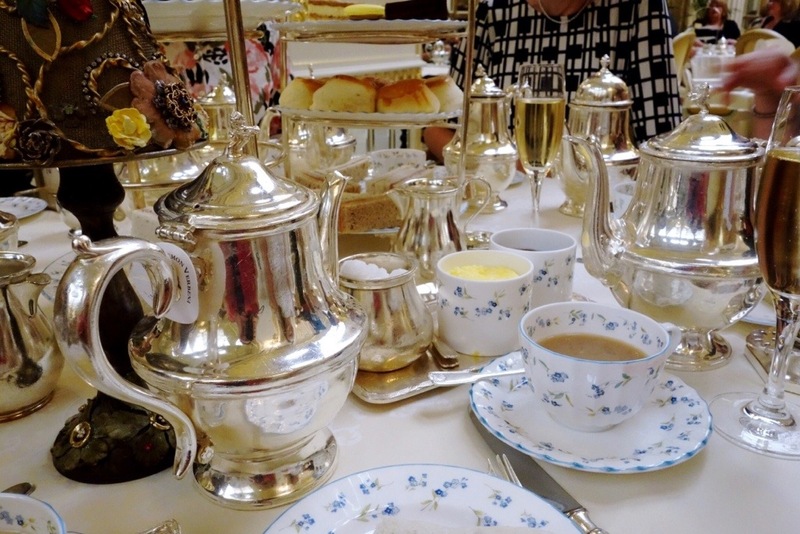 Our shiny silver tea pots were delivered to the table, and platters with crustless finger sandwiches and pastries soon followed. 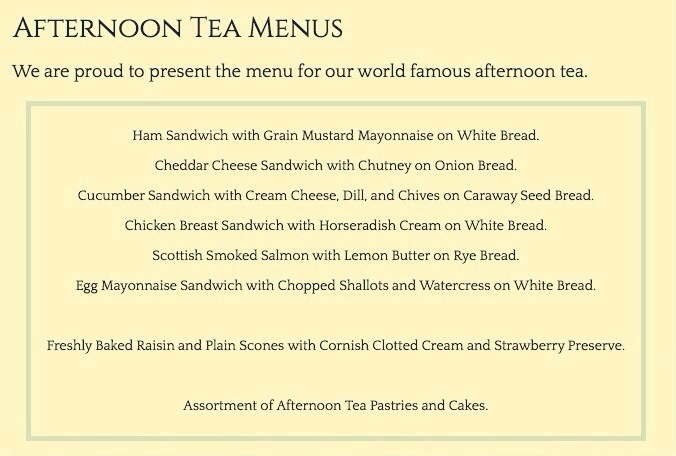 They serve the scones at room temperature, so they would be placed on the serving platter a bit later. My favorite sandwiches were the cucumber and the salmon. The flavors were so intensely fresh and palatable. I could have eaten the entire selection of sandwiches, but I forced my best ladylike restraint and moved on to a scone. Fluffy, golden scones waiting to be sliced and topped with Cornish Clotted cream and strawberry jam. Having never had clotted cream before, the ladies educated me that jam on top of cream is the Devon method; cream on top of jam being the Cornwall method ((which of these two ways is the right way is a very serious ongoing debate in the UK)). I utilized each method on the halves of my scone and decidedly prefer the Devon way. Sorry Cornwall. Again, using my ladylike restraint, I moved on to the pastries instead of another scone, or three. I’ve written about my new-ish French macaron obsession, so there was no question which of the colorful pastries I would choose. I don’t even recall what flavor it was, but that little yellow macaron was divine. I also tried half of a cream slice. A kind gentleman would soon come by offering slices of lemon drizzle cake and sticky toffee pudding cake. I want one of each. This is the Ritz. I’m going to have to choose just one. You’ve got to be kidding me. Alright then. Sticky toffee for the win. Lucy came equipped with a little game of ‘how well do you know your spouse,’ and began asking Rosie questions about Alex ((Andrew’s brother; the groom)) and their relationship. Lucy had already secretly interviewed Alex with the same set of questions, so this little game had Rosie under pressure to get the answers correct! She was a good sport, and got most of them right. We all chatted about the upcoming wedding, logistics, what we were wearing, etc. The two hours went so swiftly by; I wish I could have stopped time. Or slowed it down to a snail’s pace. It was a truly divine British experience. Thank you, Rosie, and my fellow group of Afternoon Tea ladies! 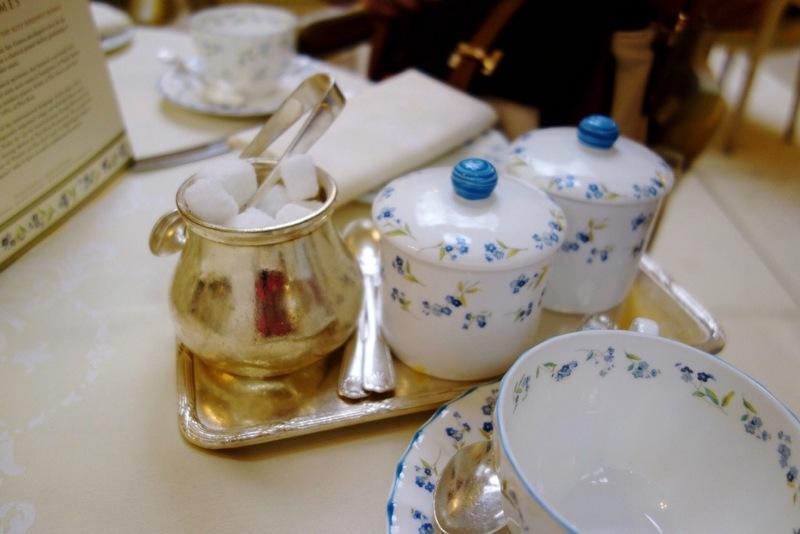 I am convinced Afternoon Tea at the Ritz is the ultimate way to celebrate a joyous occasion in London. 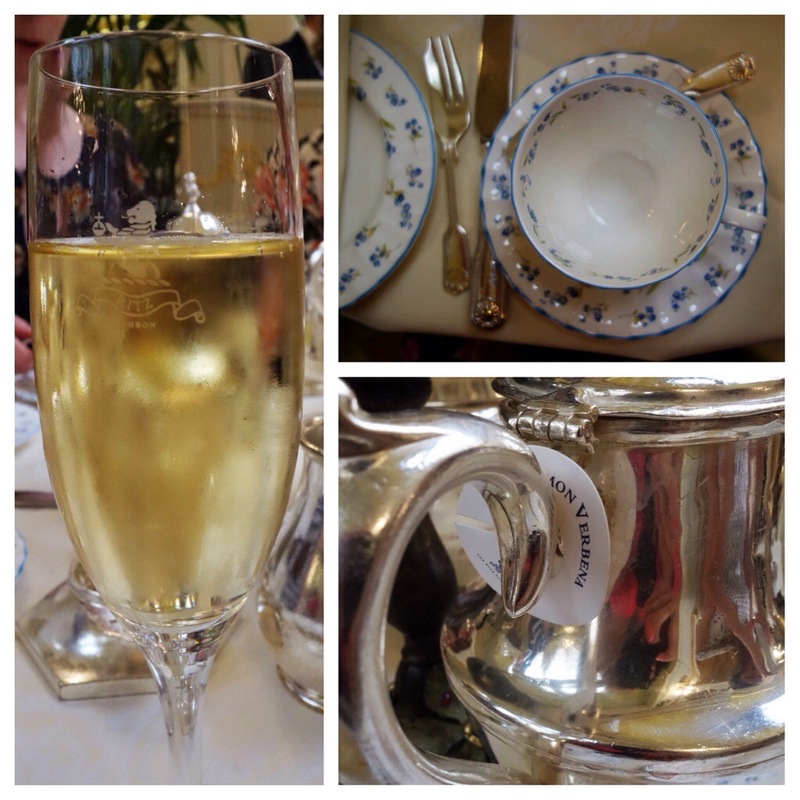 I highly recommend doing a fancy tea at least once in your life! 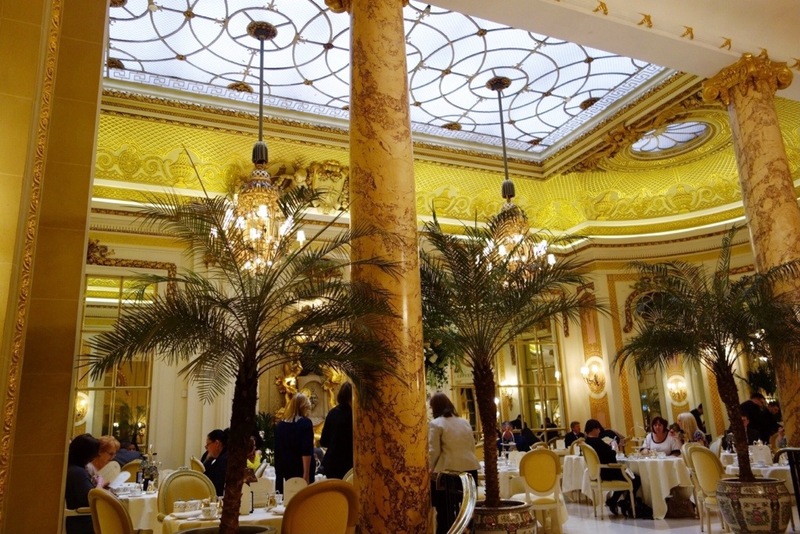 If you are planning one at The Ritz, remember to book well in advance, as they fill up quickly. 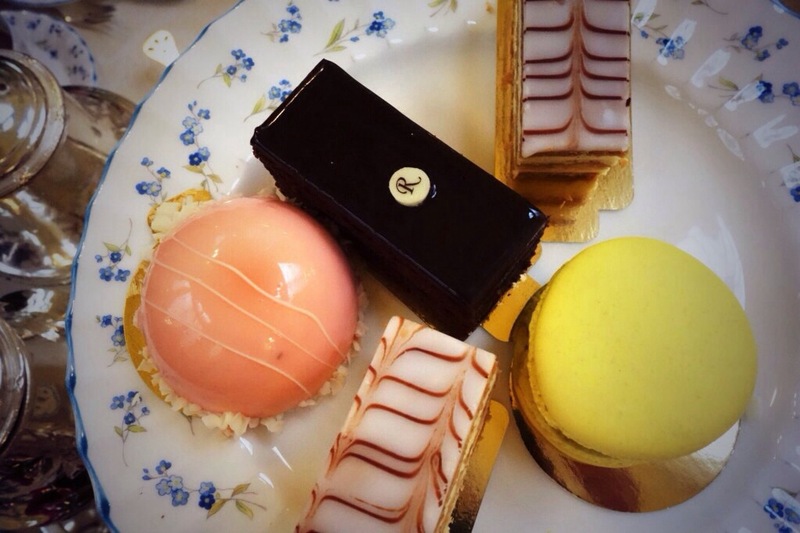 The cost of the traditional Afternoon Tea is a splurge at £47 per person, or $79. 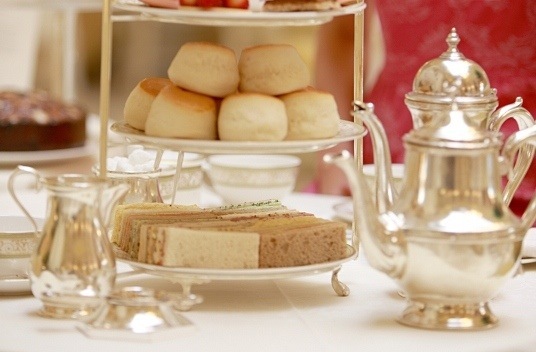 You can upgrade to a champagne tea for £59, which includes everything in the traditional tea plus a Ritz-etched glass of bubbly. 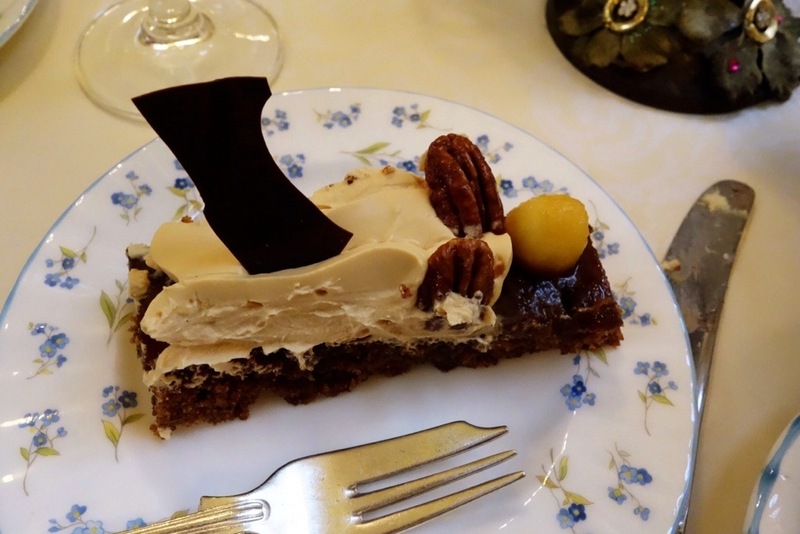 My mouth is watering, just reading your blog! please pass the cube! mm, it looks nicer than the Dorchester! 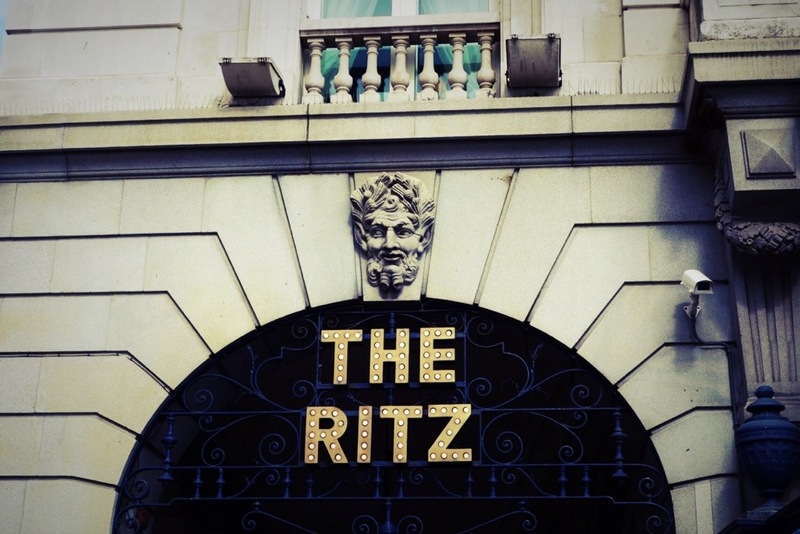 There is simply nothing better than putting on the ritz AT THE RITZ. What a fabulous afternoon for a beautiful occasion. Agreed! Thanks for the comment.